Start your holiday in the vibrant Scottish capital. After checking into your hotel, grab your CosmosGO app and start exploring. Later in the afternoon, meet your Tour Director who has everything you need to begin your Scotland adventure. Embrace your inner Scot by joining our optional Scottish Evening with bagpipers, Highland dancers, and the Ceremony of the Haggis. The day is yours to explore all that Edinburgh has to offer. Explore on your own, or join us for an optional morning city sightseeing tour with a local guide for a visit to Edinburgh’s Old Town, the New Town, and the castle to see Scotland’s Crown Jewels. The views over the city are unparalleled. From Edinburgh, we head to St. Andrews, a vibrant, bustling hub of color with an eclectic mix of independent art galleries. While at the home of golf, look for the 18th hole of the world’s most famous golf course. Later, we travel on to the Highland resort of Pitlochry, where you will spend the next two nights. 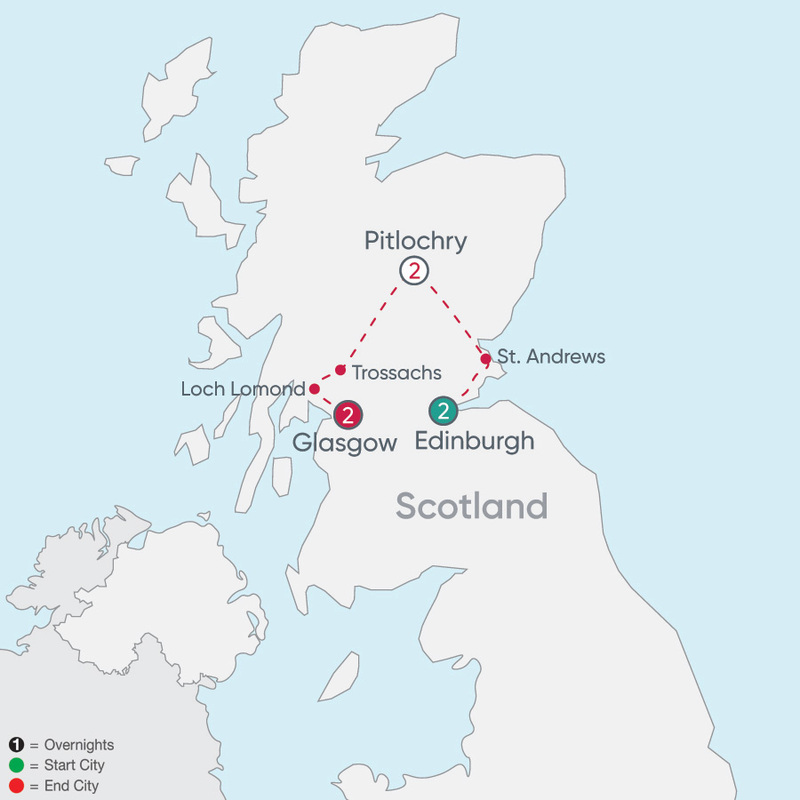 In the heart of Scotland, Pitlochry is famous for its hospitality, sparkling air, beautiful scenery, and lots to see and do. The town is a bustling resort, welcoming visitors for over 170 years, and rich with Victorian Scottish Baronial architecture. Here, discover the mystical side of Scotland. Standing stones, stone circles and ancient sites, including the famous Dunfallandy Stone, are an easy walk from the town center. The poet Sir Walter Scott described Perthshire as “the fairest portion of the northern kingdom.” As you move through its serene glens, lush forests, and rushing rivers, it’s easy to see why. Follow the Tay upriver to the loch and admire the gorgeous scenery before you enter The Trossachs National Park. Enjoy the breathtaking views at the “Bonnie Banks” of Loch Lomond on your way to Glasgow. Before checking into your hotel, an orientation drive takes in the 12th-century cathedral, imposing university buildings, and elegant Georgian squares. Grab your CosmosGO app and set out to explore this vibrant and dynamic city your way. With more than 20 museums and art galleries, there’s no shortage of artistic surprises. How about some retail therapy? Don’t miss the “Style Mile” with its high street stores, independent boutiques and vintage fashion shops. If so inclined, indulge in a Scottish whisky and a sumptuous meal in Merchant City. You’re also welcome to join us on an optional excursion as a finale to your Scottish adventure. MyCOSMOS makes it easy to reserve your spot. Glasgow. Your Scottish adventure ends this morning.